Wood is the only 100% renewable building material, so using it instead of non-renewable materials based on fossil fuels considerably reduces the environmental impact (“carbon footprint”). Wood consists of water and carbon. When growing, wood binds one ton of carbon dioxide (CO2) per one cubic meter of wood, changing it into carbohydrates and releasing oxygen in the air at the same time. During the life cycle of a wood product or a building, carbon dioxide is permanently stored in the material. A well maintained log house may last for centuries, and at the end of its long life cycle, wood is still useful as a recyclable material. Building a Mountain Lodge Home promotes sustainable forest management, as we only use wood from PEFC certified forests, complying with the COC (Chain of custody) certificate to confirm the origin of all wood raw material. The PEFC Council (Programme for the Endorsement of Forest Certification schemes) is an independent, non-profit organisation, which has set the criteria based on internationally accepted requirements. Annual forest growth clearly exceeds harvest in Finland. It is reasonable to use timber for housing for many reasons, e.g. afforestation (planting), which means that young, growing forests bind more carbon than older forests. By taking care of forests and using wood we can together tackle the climate change and meet the Kyoto commitments for our part. A Mountain Lodge Home is a low energy product. Processing of wood requires only a fraction of the energy needed by other building materials such as steel, concrete, plastics and aluminium. Moreover, the factory is located near the raw material sources, in the middle of forests, minimizing the need of transportation. In addition, energy consumption also remains minimal during construction because only simple tools are required. Our factory continually develop their processes to make them more environmentally efficient at all levels. By-products such as bark, saw-dust and waste are 100% recycled or used for bioenergy production. Wood is renewable and most ecological building material. The popularity of wood construction is growing strongly, and it is also promoted by governments. The time has come to understand the true value of renewable materials. By increasing the use of wood as a building material, we can save non-renewable natural resources for the future, especially where there is no alternative material available. From the environmental point of view energy efficient living includes many aspects, starting from the building materials. Considering the remarkable differences in the environmental burden caused by building materials, it is sensible to choose materials which are both produced and used energy efficiently. 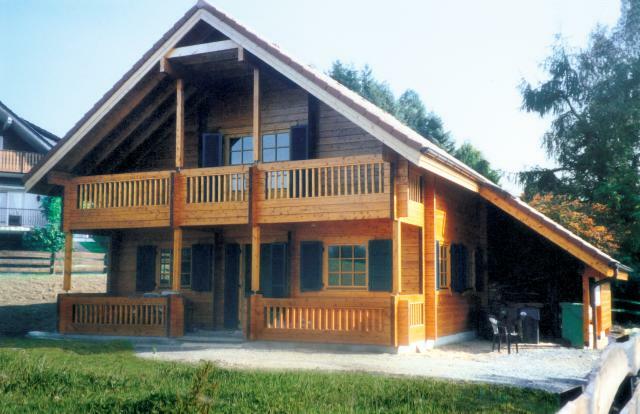 Log houses typically include more wood and less other materials than timber framed buildings. A well designed and well built Mountain Lodge Home is solid and tight. Industrially and precisely manufactured logs with exact joints prevent uncontrolled ventilation through structures.The insulation and thermal mass qualities of solid wood naturally maintain the desired temperature level in all conditions, making it very energy efficient. By also paying attention to your everyday living routines, you can achieve great savings in total energy consumption.